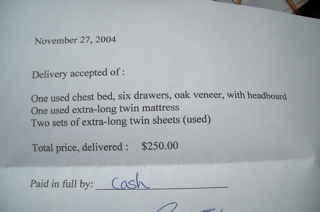 We posted The Amazing Chest Bed on Craigslist on Tuesday, got about a dozen inquiries in all, and had a buyer Friday night. This morning, Kate and I delivered it to a couple who live in San Francisco’s Richmond District — out around 20th Avenue and Geary Boulevard. We took it apart and packed it into the Amazing Dodge Caravan last night, then drove it over there this morning. I meant to take my camera along to take a picture of where the bed wound up — the buyers had what amounted to a walk-in closed with a window that the bed fit into perfectly. Kate did most of the reassembly, we got paid, Kate had the purchaser sign a little receipt she made up (she made two copies, so he got one, too). The we drove home by way of the Golden Gate Bridge, stopping in Tiburon for a mediocre breakfast on the way. That is all from Amazing Chest Bed Central.